This time of year, frou-frou beverages take their leave. Light, frothy cocktails tasting of coconut and grapefruit bow out for a few months, making way for the more warming, comforting beverages that seem to seep into one’s bones, brightening up cooler winter days. At home, bottles of the man’s Scotch are slowly drained (at the moment, it’s Glenmorangie 10-year), darker beers began to make an appearance (Left Hand Milk Stout and Great Lakes Christmas Ale), and I find that one of the few things that warm up my insides is Bourbon. In any form. I’m partial to hot toddies before bed- warm water or tea, a healthy addition of Old Forrester, honey, lemon- but whiskey sours full of egg white and bitters, a sweet, simple pour of Elijah Craig, or Louisville’s own Old Fashioned will do the trick as well. At home, we’ve perfected the making of Old Fashioned for our taste, usually with brown sugar or demerara syrup, orange bitters, and a luxardo cherry or twist of orange peel. Still, there’s always room for experimentation, so when I stumbled across the Bourbon Thyme Cocktail from Salted Plains, I felt the need to give it a shot. 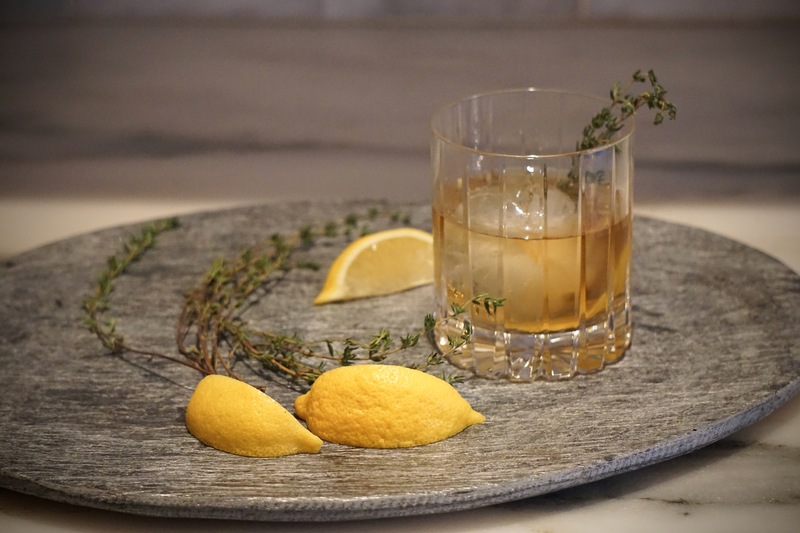 Simple, with Angostura bitters and Bourbon, this version uses a homemade honey and thyme syrup. During the making of the sweetener, my kitchen smelled Heavenly, though I’m a huge fan of the scent of thyme. For a cocktail you’d just want to whip up for company when one drops by to warm their insides, this may not be the one, as there’s some time involved in the syrup, but pre-dinner guests or for the two (or one) of you on a weekend, this little guy may be the fragrant winter cocktail you’ve been craving.